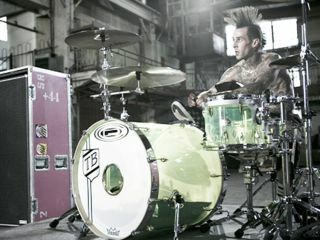 A blown tire is being investigated as the possible cause for the jet crash that killed four people and seriously injured former Blink-182 drummer Travis Barker and DJ AM this weekend in South Carolina. The National Transportation Safety Board has not yet concluded what caused the Learjet crash, but a cockpit recording indicates that the crew believed a tire blew whie taking off, after which attempts to abort take-off failed. The two crew in the plane - pilot Sarah Lemmon, 31, and co-pilot James Bland, 52 - died within minutes of the crash from smoke inhalation and burns, while Travis Barker's assistant, Chris Baker, 29, andbodyguard, Charles Still, 25 died from the impact of the crash. According to a witness, Barker and AM were discovered "in the street near the fiery wreck as they frantically tried to douse their burning clothes." Officials are waiting to talk to the two musicians, who remain in critical but stable condition at the Joseph Still Burn Center, in Augusta, Georgia and are being treated for first and second degree burns. Doctors say they are expected to make a full recovery. The pair were visited in a Georgia hospital yesterday by producer Jermaine Dupri, singer/actress Mandi Moore and Barker's ex-wife Shanna Moakler. Moakler issued the following statement: "There are not enough words to express how thankful we are for the outpouring of love and support we have received during this very difficult time. We can only ask for prayers as we heal and mourn the loss of our dear friends who we considered part of our family. Our lives will be changed forever."